Your audio system allows you to listen to music from the Pandora’ app on a compatible smartphone. This function is available when the phone is paired and connected to the vehicle’s Bluetooth’ HandsFreeLink’ (HFL) system, or with an iPhone, you can connect using your USB cable to the USB port. Pandora’, the Pandora logo, and the Pandora trade dress are trademarks or registered trademarks of Pandora Media, Inc., used with permission. Pandora is only available in certain countries. Visit the Pandora website for more information. 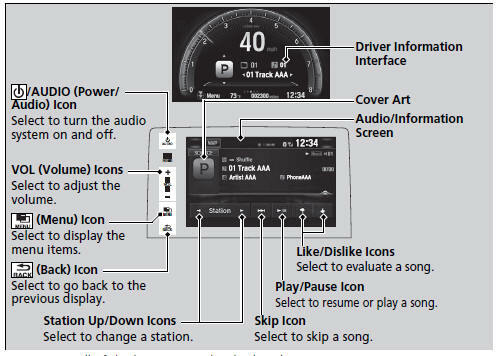 To find out if your phone is compatible with this feature, visit www.handsfreelink.honda.com, or call 1-888-528-7876. To use this service in your vehicle, the Pandora’ app must first be installed on your phone. Visit www.pandora.com for more information. Pandora’ is free, personalized radio that plays music and comedy you’ll love. Just start with the name of one of your favorite artists, songs, comedians or composers and Pandora’ will create a custom station that plays similar tracks. Pandora’ also features hundreds of genre stations ranging from Dubstep to Smooth Jazz to Power Workout. If you cannot operate Pandora’ through the audio system, it may be streaming through Bluetooth’ Audio. Make sure Pandora’ mode on your audio system is selected. If your phone is connected to Android Auto, Pandora is only available through the Android Auto interface. Visit the Android Auto website to check compatibility. Available operating functions vary on software versions. Some functions may not be available on the vehicle’s audio system. Pandora’ may limit the total number of skips allowed on the service. If you dislike a track after the skip limit has been reached, your feedback will be saved but the current track will continue to play. 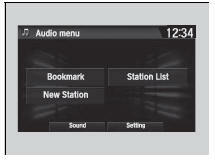 To change stations, activate the Pandora’ menu, select Station List, and then select a new station. It also changes stations on the main Pandora’ screen.